High Quality Content by WIKIPEDIA articles! Trochenbrod or Trochinbrod in Russian (Polish: Zofiówka, Ukrainian: ????????? 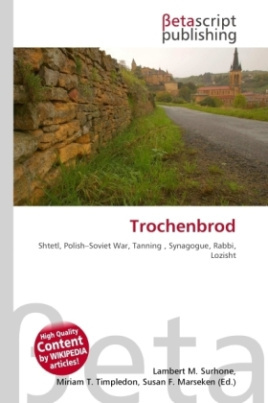 ?, Trokhymbrid) was a Jewish shtetl (village) with an area 1,728 acres (6.99 km2) once located in what is now western Ukraine but which used to be a part of Poland (Wo?y? Voivodeship, ?uck County, Gmina Silno), about 30 kilometers northeast (although the coordinates above place it about 19 kilometers south southeast (this coordinates are wrong, the nearest now existing villages are ??????? and ???????? ) of Lutsk. It was also known as Sofievka or Zofiówka, named after Sofia, a Russian princess who donated land for the Jewish settlement. Trochenbrod was founded in 1835, initially a farming colony which grew into a small town. The population grew from around 1,200 (235 families) in 1889 to 1,580 in 1897. During the Polish-Soviet War, the town was captured by Poland. By 1938 the town's exclusively Jewish population had grown to at least 3,000.Most of the population were engaged in farming, dairy farming, or tanning.